Can’t Do Pull Ups In P90X? Tony Horton makes it look so easy. Pull ups are one of the most intimidating exercises for people to do. It’s the one move which shows how strong you are from head to toe. It’s really easy for people to give up after not being able to do one pull up on the first day of P90X. We’ve all been there. The good news is you will be able to do them the more you try. Nobody is expecting you to go from 0 to 20 pull ups in a week. You’d be lucky to get 20 at one time in the entire 90 days of P90X. It’s gonna take time. There are a lot of ways to get better at doing pull ups. Tony Horton shows you a couple different ways to modify the pull up in P90X so you build up strength to be able to do unassisted ones in the future. Use A Chair – This takes some of the weight off the bar so you can focus on doing the move. Workout With A Friend – If you are doing P90X with friends or family then have the other person spot you. I remember my first time doing P90X Chest & Back and not being able to do any. Had my buddy Joe there to spot me through 15 reps. My biggest issue was finding the strength at the very bottom of the rep to start upwards. After 2 weeks I could do a couple on my own and increased from there without any help. Resistance Bands – Wrap one of Beachbody’s B-Lines resistance bands around the P90X chin up bar or something else in your house and do what Tony Horton tells the people in the workout to do. This is an easy way to start building up your strength. $40 for three resistance bands. 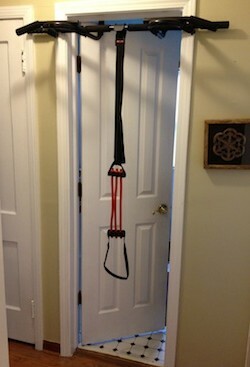 Chin Up Max – Has three resistance bands and a foot strap that clip onto your P90X Pull Up Bar. Put your foot into the hole and use the momentum for the bands to assist you with the pull up. As close as you can get to doing unassisted pull ups. $40. I use all three of them. My favorite is the Chin Up Max because you work so much more of your body. The Door Attachment Kit is nice if you just don’t have a lot of energy that day. And it’s easy to travel with too. 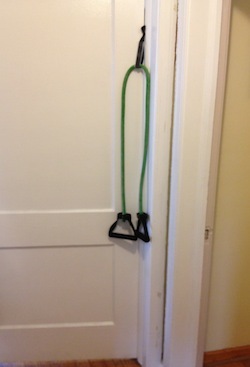 If doing unassisted pull ups is a ways away yet then get the door attachment kit. It will build up the muscles needed to do regular pull ups. If you can do one pull up or are not that out of shape then you will want to get the P90X Pull Up Bar because you will be doing pull ups in no time. Here is how I have them set up at my house. If those additional items are out of your budget then you can always do some bent over rows with dumbbells or resistance bands. Both are moves Tony Horton shows how to do in P90X. If you can find the money to buy those and the P90X Pull Up Bar then go and get them. There is no better feeling of accomplishment then seeing your reps go up on the pull up bar. Just because you can’t do pull ups now is no reason to not do P90X. I felt the same way at the beginning. Be patient and keep showing up. You’ll be surprised how fast you go from 1 to 3 to 8 to 15. At the end of my first 90 days of P90X the pull up became my favorite move. It was a bench mark for how fit I was. Keep your head up and listen to Tony Horton. He’ll show you the way.